Charles Darwin is a towering figure in the history of science, who changed the direction of modern thought by establishing the basis of evolutionary biology. 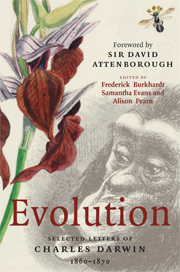 With a Foreword by Sir David Attenborough, this is a fascinating insight into Darwin's life as he first directly addressed the issues of humanity's place in nature, and the consequences of his ideas for religious belief. Incorporating previously unpublished material, this volume includes letters written by Darwin, and also those written to him by friends and scientific colleagues world-wide, by critics who tried to stamp out his ideas, and admirers who helped them to spread. They take up the story of Darwin's life in 1860, in the immediate aftermath of the publication of On the Origin of Species, and carry it through one of the most intense and productive decades of his career, to the eve of publication of Descent of Man in 1871. Foreword Sir David Attenborough; Introduction; Editor's note; Symbols and abbreviations; Prologue; 1860; 1861; 1862; 1863; 1864; 1865; 1866; 1867; 1868; 1869; 1870; Biographical register; Bibliography of biographical sources; Bibliographical note; Acknowledgements; Index.